mommy's reviews: Preparing Your Home For The Holidays With Softsoap's Limited Edition Scents! Preparing Your Home For The Holidays With Softsoap's Limited Edition Scents! Have I mentioned lately that I cannot believe Christmas is a little less than 2 months away??????? Last year at this time I was pregnant and sick...not looking forward to the holidays simply because I had no energy to prepare for them. This year, I have a beautiful baby boy and my two other blessings and we are gearing up for the holidays! I am soooo excited for this year. I just finished my fall decorating but am faced with the reality that in no time, those fall colors will be coming down and the Christmas decorations will be gracing every inch of my home. One of my favorite parts of the season is putting out my seasonal hand soaps. For the fall, I have spiced pumpkin, apple spice and other scented soaps in my bathroom and kitchen. When Christmas rolls around, I will have pine, mistletoe and cranberry scents in my home and I LOVE the spice scents! This year, I have been so excited to find out that Softsoap has released three lovely new seasonal scents. I am all for putting out season-specific soaps in my bathroom...it just adds so much festivity. Right now because Thanksgiving is coming up, I have a pumpkin scented soap in my bathroom. 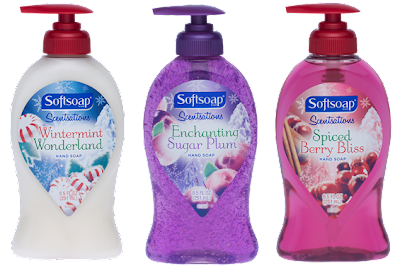 I am sooo looking forward to the fun soaps that are going to be featured in my bathroom this year for the Holiday Season...thanks to Softsoap! Softsoap is a product from Colgate and they create some pretty amazing liquid hand soaps, body washes and other personal care products. So, for this review I was sent one of each of their newest liquid hand soaps to try out and I am very impressed! I was sent Wintermint Wonderland, Enchanting Sugar Plum and Spiced Berry Bliss. The Softsoap brand is very luxurious to use...very creamy and, well, soft! My favorite scent had to be the Wintermint Wonderland. It smells like peppermint and candy canes. The color of the label is also really festive and wintry looking. The soap itself bubbles up nicely and feels really nice on my hands. I wash my hands A LOT throughout the day and it is nice to have something gentle for my skin. I also enjoyed the Enchanting Sugar Plum scent as well...it is really fruity smelling! My mom fell in love with the Spiced Berry Bliss and so I let her take it home with her. :) She said it would match her bathroom decor perfectly! She loves scented soap as much as I do and so this was a fantastic product for her as well. These three luscious soaps are available at Walmart from now until December 2012 and retail for just $2.29. For other soap selections and information, check out Softsoap online...they offer some really great products! 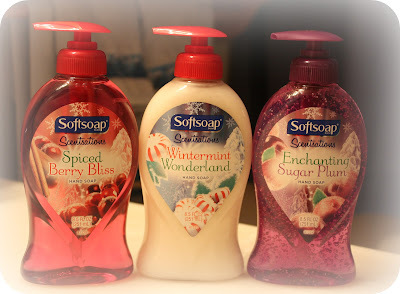 So, in my opinion...I love these new Holiday Hand Soaps from Softsoap! Decorating could not be easier...the gorgeous labels and fun colored soaps are going to add so much to what ever room they are in. I am also loving the scents...they all smell amazing! I would definitely recommend these soaps to anyone looking to add a special touch to their Holiday Season. Disclaimer: I received no monetary compensation for this post. I did receive free Softsoap products for review purposes. All quotes and stock photos are from the Softsoap website and email. All thoughts and opinions are 100% mine.